. Make paste of ginger and garlic. 2. Make paste of chillies. 3. 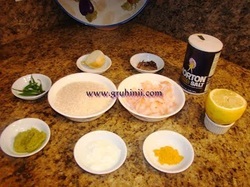 Clean the shrimp and marinate for 1/2 hour with little salt ,Haldi and 1 tea spoon of ginger garlic paste. 4. Wash the rice and keep it aside for 15 mts. 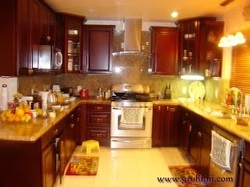 Heat oil in a pan or Pressure Cooker . First put spices of Cloves, cinnamon sticks and shajeera, fry for 30 seconds, now add chopped onions and two whole chillies to it . Fry until they turn to golden color. Now add remaining ginger,garlic and green chillie paste to let it fry one minute. Add shrimp to it, fry for 2 mts. Add curd and add soaked rice . Fry all these for 2 minutes . Then add 4 cups water to it, add salt, just cover the lid and keep it on low flame for 1/2 hr.